“…but they killed him not, nor crucified him, but so it was made to appear to them, and those who differ therein are full of doubts, with no (certain) knowledge, but only conjecture to follow, for of a surety they killed him not.” – Holy Qur’an 4:157. “The Resurrection is the supreme vindication of Jesus’ divine identity and his inspired teaching. It’s the proof of his triumph over sin and death. It’s the foreshadowing of the resurrection of his followers. It’s the basis of Christian hope. It’s the miracles of all miracles.” Paul perhaps said it best: “And if Christ be not raised, your faith is vain; ye are yet in your sins” [I Corinthians 15:17]. In the Qur’an, we are in fact told that many prophets and messengers were saved from the imminent wrath of God descending on their unbelieving communities. Allah mentions Moses’ flight out of Egypt, Noah’s construction of the ark, Lot’s departure from the cities of the plain, and the prophets Shu’ayb, Salih, and Hud finding sanctuary after Allah’s command. Nowhere are we told, however, that a prophet being stoned, crucified, or disemboweled is “incompatible with Allah’s absolute sovereignty.” On the contrary, Allah has revealed through His Prophet concerning the rebellious Children of Israel: “We gave Moses the Book and followed him up with a succession of messengers; We gave Jesus the son of Mary clear (signs) and strengthened him with the holy spirit. Is it that whenever there comes to you a messenger with what ye yourselves desire not, ye are puffed up with pride?- Some ye called impostors, and others ye slay” [Qur’an 2:87; Also see 3:21, 183; 5:70]. “Muhammad is no more than a messenger: many were the messenger that passed away before him. If he died or were slain, will ye then turn back on your heels” (Qur’an 3:144)? The Christian may ask you, “If Jesus could have been slain or crucified, then why does the Qur’an say that he wasn’t (4:157)?” Because it is simply a fact that Jesus was not crucified! There would be no incongruity within the message of the Qur’an or Islam if Jesus is killed on a cross or not; we don’t even believe that he atoned for our sins so what difference does it make to us? Why does Allah find it so important to mention in His eternal Word that Christ wasn’t crucified when there is no religious significance attached to the manner of his death for Muslims? It’s important because it never happened, that’s why. We will examine this so-called “resurrection” a little later in this chapter. For now, you should be aware that Islam’s aim is to make one conscious of the next world. If all of the inhabitants of this planet were singing your praises and decided to elect you the dictator of Earth, it would not benefit you one iota if Allah were displeased with you. Muslims would most certainly honor any prophet who is killed without warrant as a noble martyr. Jesus, however, was never killed. “O Jesus! I will take thee and raise thee to Myself and clear thee (of the falsehoods) of those who blaspheme; I will make those who follow thee superior to those who reject faith, to the Day of Resurrection: Then shall ye all return unto me, and I will judge between you of the matters wherein ye dispute” (Qur’an 3:55). This is the extent of our sure knowledge regarding the end of Jesus’ earthly ministry. Any speculation other than what Allah has told us would render us no better than the astray Christians whom Allah charges as possessing “no certain knowledge but follow only conjecture” (Qur’an 4:157). But simply for the sake of argument, and also to appease our Christian questioners, let’s examine two of the most widely held Muslim theories as to what indeed happened to the son of Mary over 2,000 years ago – 1) The Swoon Theory and 2) The Substitution Theory. Remind your Christian friend that these are only possibilities, and that the exact sequence of events brought about by Allah to save Jesus are not known by anyone save Allah Himself. (Note: Orthodox Islam does not subscribe to the factional Ahmadiyya belief that Jesus did in fact swoon and then move to India where he died as an old man.) The Swoon Theory, although much less popular among Muslim scholars, will be the focus of our first analysis. The erudite Ahmad Deedat (may Allah have Mercy upon him) has shown great effort in utilizing the evangelical witnesses to support this theory in his book Crucifixion or Crucifiction. The theory states that although Jesus might very well have been “crucificted,” that is, placed on the cross, he was not “crucified,” or killed on the cross. As Deedat points out, there is simply no verb in the English or Greek languages to describe a person who has been nailed to a cross yet survived. If you say that he or she was “crucified,” then you should expect the person to be dead. Every Good Friday in the Philippines extremist Catholics re-enact the scourging and killing of Jesus by nailing themselves to crosses yet none of them die from their experiences. Were they then really crucified? Therefore, we can rightly say according to this theory, that Jesus was crucificted, and survived his ordeal at Calvary. Interestingly, Jesus provides himself the greatest evidence in support of this theory as we will see below. The Gospels tell us of many miracles that Jesus performed while preaching to his people in Galilee and Jerusalem. But what was the greatest miracle of Jesus? Christians would contend that it was his apparent rising from the dead. Jesus does in fact reveal what his lasting miracle will be in Matthew 12:39, 16:4, and Luke 11:29. We are told that a group of sadistic Pharisees approach Jesus with a special request. Although they had certainly heard or perhaps even seen with their own eyes Jesus do the seemingly impossible, such as raise the dead, feed multitudes, or heal the blind and lepers, they ask him to perform a miracle on demand. They say, “Master, we would see a sign from thee.” In other words, “Show us a trick so we can be amused!” But unlike your average street magician, Jesus is not prepared to pander at the bidding of these unbelieving “vipers” and rebukes them severely: “An evil and adulterous generation seeketh after a sign.” It takes a very low level of faith to be swayed in our religious convictions by simply watching a man pull a rabbit out of his hat. Allah has similarly told us regarding Muhammad in the Word of God: “The Unbelievers say: ‘Why is not a sign sent down to him from his Lord’” (Qur’an 13:27)? The nature of Jesus’ teaching, his extreme piety, and his guiding moral example should have been “sign” enough for the Pharisees, but their hearts were diseased and physical miracles of the immediate nature was not a cure that Jesus saw fit for them. Jesus continues: “and there shall no sign be given to it, but the sign of the prophet Jonas: For as Jonas was three days and three nights in the whale’s belly; so shall the Son of man be three days and three nights in the heart of the earth” (Matthew 12:39-40). This was Jesus’ greatest and lasting miracle – The Sign of Jonas. So what exactly did happen to Jonas? Let’s examine this tiny book of only four chapters found in the Hebrew Bible. A much less detailed story of Jonas, or Jonah, is also found within the pages of the Qur’an, and he remains the only prophet with the distinct honor of having both a book of the Bible and chapter of the Qur’an named after him (Chapter 10, Surah Yunus). We are told that God instructed Jonah to go to Nineveh and admonish the populace of the city about their wickedness. For reasons not given in the Biblical reading, he decides rather to go down into Joppa and hitches a boat ride across the sea headed for Tarshish. Suddenly a great storm arises and the men present on the boat feel that someone in their very midst brought with him an evil omen. They decide to cast lots and sure enough, the blame fell squarely upon Jonah. Jonah explains to the heathen men that he was a Hebrew who had “fled from the presence of His Lord” and that the only solution to this problem would be to cast him into the sea. The men refuse and row desperately toward land but fail. After repeated attempts to spare Jonah’s life, they supplicate unto God: “We beseech thee, O Lord, we beseech thee, let us not perish for this man’s life, and lay not upon us innocent blood: for thou, O Lord, hast done as it pleased thee” (Jonah 1:14). Compare the men’s gesture of absolving themselves of all guilt with Pilate washing his hands and remarking: “I am innocent of the blood of this just person (Jesus): see ye [to it]” (Matthew 27:24). In order to calm the torrential storm, the men cast Jonah into the sea and offer sacrifices and vows. Therefore, one man must die to save the others. In John, the High Priest Caiaphas, fearing another doomed Jewish insurrection led by Jesus, comments: “One man should die for the people, and that the whole nation perish not” (John 11:50). Now we are told that a great fish or whale swallows Jonah whole and he stays inside of its massive belly for three days and three nights praying to the Almighty. Finally, after uttering the clinching words, “Salvation is of the Lord!” (Jonah 2:9), God orders the fish to vomit him onto dry land. Jonah goes straightway into Nineveh and after giving his people a renewed sense of faith, they immediately become believers. After reading the entire book of Jonah you may think to yourself, “what was the miracle or sign that Jesus referred to and what does it have to do with Jesus?” After all, Jesus does say: “For as Jonas was a sign unto the Ninevites, so shall also the Son of man be to this generation” (Luke 11:30). What was Jonah a sign of? Imagine that you were on that boat and witnessed the events that took place on that stormy night. You saw how Jonah was tossed overboard and left to tread water in the vast sea and as you and the other men begin to row away, you are shocked to see a huge fish swallow Jonah and disappear under water. What would you conclude about the physical condition of Jonah? You would be very safe in assuming that he has died. To your utter amazement, however, you spot Jonah walking the streets of Nineveh three days later. What has happened? Is he a ghost? Has he been resurrected? What? Christians will try to convince you that Jesus was simply referring to the time factor, not the physical condition of Jonah. They will say, “Jesus meant that he will be ‘entombed’ for three days and nights like Jonah was.” Simply going into a tomb for three days, however, is not a miracle. Even you or I can go into a tomb or a cave for three days and nights and emerge unscathed. The real miracle of Jonah was that he was supposed to die but did not. Jonah proved to his people the power of his God by escaping death. This evidence was enough to convince the Ninevites of the truthfulness of his prophetic mission and they repented unto God and entered into faith. Jesus likewise demonstrated the power of “his Father” by conquering death and thus providing further evidence that he was the true Messiah of the Jewish people. He had never died, and is still alive. Luke 24 tells us that Jesus appears to his disciples after the “resurrection” in the Upper Room. He narrates: “And as they thus spake, Jesus himself stood in the midst of them, and saith unto them, Peace be unto you” (verse 36). Notice the reaction of the disciples in the next verse: “But they were terrified and affrighted, and supposed that they had seen a spirit ” (verse 37). Why did the disciples suppose that Jesus was a spirit when he looked no different than before? We have to go back to the story of Jonah. If one of those men in the boat saw what had happened to Jonah in the sea and then saw him again three days later on land, he would also conclude that it was the ghost or spirit of Jonah. This is exactly what the disciples believed about Jesus. Therefore, he sets their hearts at ease: “Why are ye troubled? Why do thoughts arise in your hearts? Behold my hands and my feet, that it is I myself: handle me and see; for a spirit hath not flesh and bones, as ye see me have. And when he had thus spoken, he showed them his hands and his feet” (verses 38-40). Jesus is essentially saying, “Why are you scared? Can’t you see that it’s me, Jesus! Look at my hands and feet, I’m the same person. Do spirits have flesh and bones like this?” The disciples, however, were still very doubtful so Jesus asks them, “Have ye here any meat?” And they gave him a piece of a “broiled fish, and of an honeycomb. And he took [it], and did eat before them” (verses 41-43). What does eating prove? It proves that he is the same physical Jesus. • “For in the resurrection they neither marry, nor are given in marriage, but are as the angels of God in heaven.” – Matthew 22:30. • “For when they shall rise from the dead, they neither marry, nor are given in marriage; but are as the angels which are in heaven.” – Mark 12:25. • “And Jesus answering said unto them, The children of this world marry, and are given in marriage: But they which shall be accounted worthy to obtain that world, and the resurrection from the dead, neither marry, nor are given in marriage.” – Luke 20:34-35. “But some man will say, How are the dead raised up? and with what body do they come? Thou fool, (Paul loves calling people fools despite Jesus’ stern warning against this.) that which thou sowest is not quickened, except it die: And that which thou sowest, thou sowest not that body that shall be, but bare grain, it may chance of wheat, or of some other [grain]: But God giveth it a body as it hath pleased him, and to every seed his own body. All flesh [is] not the same flesh: but [there is] one [kind of] flesh of men, another flesh of beasts, another of fishes, [and] another of birds. [There are] also celestial bodies, and bodies terrestrial: but the glory of the celestial [is] one, and the [glory] of the terrestrial [is] another. [There is] one glory of the sun, and another glory of the moon, and another glory of the stars: for [one] star differeth from [another] star in glory. So also [is] the resurrection of the dead. It is sown in corruption; it is raised in incorruption: It is sown in dishonour; it is raised in glory: it is sown in weakness; it is raised in power: It is sown a natural body; it is raised a spiritual body. There is a natural body, and there is a spiritual body.” – I Corinthians 15:35-44. “What about Lazarus! ?” my Christian friend exploded. “Was he not physically resurrected by Jesus and not made spiritual?” The answer is yes. But where is Lazarus now? He’s dead. He died twice. Let’s turn it over to Paul: “And as it is appointed unto men once to die, but after this the judgment” (Hebrews 9:27). The Christian at this point must either agree that there is clear contradiction in his Bible, or admit that Lazarus’ resurrection was the exact same type as that of the Christian Jesus, namely, physical yet transformed (spiritual). So what is the solution? It’s a lose/lose situation! There are only three possible explanations for Jesus’ physical appearances after the “resurrection.” The first possibility, known as the Doomsday resurrection, maintains that Jesus was raised in a physically “transformed” body identical in nature to that in which we are all raised on the day of general resurrection at the end of time. This would make Jesus immortal and spiritually oriented. This was also precisely the type of body that the disciples thought Jesus was raised into in Luke 24. Again, Jesus corrects them by stating that he was not a spirit, but the same Jesus. He then eats to further prove that he is not spiritually but rather physically oriented. Christians run into trouble here when they claim that Jesus was physically resurrected yet immortal, but not spiritual. This argument is completely devoid of logic because immortality is an attribute of spiritualized bodies, not physical ones. If a Christian wants to say that Jesus was resurrected immortal, then he must also say that he was a spirit, yet Jesus denies this. Unlike Luke, John mentions that the “doors were locked” when Jesus appeared to his disciples, seemingly materializing out of thin air! (John 20:19). Only a spiritually resurrected body can do this. So was he a spirit or not? Who is lying, John or Jesus? A second possibility, known as the Earthly resurrection, asserts that Jesus was raised into the same exact physical body that he had been in before his death. This would make Jesus mortal and physically oriented. This type of resurrection is identical in nature to those of Lazarus mentioned in the Gospel of John, and ‘Aziz mentioned in Sura 2 of the Holy Qur’an. This would also mean that Jesus was subject to hunger, thirst, pain, fatigue, and death. Ask your Christian friend that if Jesus were to be spotted by a group of Pharisees after his resurrection, would it be possible for them to mob Jesus and kill him again. The Christian will say no. But why? He will answer, “Because he was immortal, and also because my Bible says that we can only die once.” Ask him, “Do you mean he was spiritualized?” If he answers no, then remind him once again that all immortal beings are spiritualized. That is why “God is Spirit” (John 4:24). If he answers yes, then you’ve got him trapped because Jesus says: “A spirit hath not flesh and bones, as ye see me have” (Luke 24:39). The third possibility, known as the Jonas resurrection, states that Jesus never died in the first place, but had escaped death as Deedat says, “by the skin of his teeth.” This is the only way to reconcile Christianity’s 2,000-year parade of confusion and misguidance with regards to the dogma of the resurrection. Mark tells us: “And they said among themselves, Who shall roll us away the stone from the door of the sepulcher? And when they looked, they saw that the stone was rolled away: for it was very great” (Mark 16:3-4). If Jesus was resurrected immortal as Christians claim, and if he could simply “beam” in and out of rooms as John says (John 20:19), then why does the stone need to be rolled away at all? Wouldn’t it be a greater, more convincing miracle if the stone had not moved yet Jesus was gone? Sure it would be. This is exactly the reason why Matthew records that the women actually saw an angel roll the stone away to reveal a missing Jesus (Matthew 28:2)! This statement of Matthew is obviously a fabrication, perhaps invented to erase from your mind the fact that one man, Joseph, was able to roll the stone over the door of the sepulcher on Friday night (Matthew 27:60). Luke and John saw it as Mark did, the stone was l already rolled away from the sepulcher (Luke 24:2; John 20:2). The fact that Jesus needed the stone removed to exit the tomb indicates that he was the same physical Jesus who never died. Mark says: “And they, when they had heard that he was alive, and had been seen of her, believed not” (Mark 16:11). The disciples heard from the women that Jesus was risen and alive. According to the Strongs’ Concordance, the Greek for risen, egeiro, also has primary definitions, “to arouse from sleep, to awake.” But if I say that a person is resurrected, then that can only mean that he or she was dead and then raised back to life. In Matthew 27:63, the Pharisees tell Pilate: “Sir, we remember that deceiver said, while he was yet alive…” Somebody should have told them that he is still “alive.” Even if Jesus did appear unto “five hundred of his brethren” as Paul says (I Corinthians 15:6), this does not prove that he was dead then resurrected but only that he was alive. • “And when they found not his body, they came, saying, that they had also seen a vision of angels, which said that he was alive” (Luke 24:23). • “To whom also he showed himself alive after his passion by many infallible proofs, being seen of them forty days, and speaking of the things pertaining to the kingdom of God” (Acts 1:3). • “And as they were afraid, and bowed down [their] faces to the earth, they said unto them, Why seek ye the living among the dead” (Luke 24:5)? The fact that Jesus is always referred to as being alive and risen rather than resurrected indicates that he was the same physical Jesus who never died. Luke tells us that Jesus actually went on a stroll to Emmaus with two of his disciples that had known him personally for at least three years yet failed to recognize him: “And it came to pass, that, while they communed [together] and reasoned, Jesus himself drew near, and went with them. But their eyes were holden that they should not know him” (Luke 24:15-16). Apparently, Jesus was still in his gardener costume. The fact that Jesus found it necessary to guise himself from unruly people who might bring him further harm indicates that he was the same physical Jesus who never died, and was in fear of being killed. On Sunday morning, Mary Magdelene, Mary the mother of James, and Salome go to the garden tomb for a very special reason. According to the Gospels, all three of these women along with Joseph of Arimathaea were present at the events that unfolded the previous Friday at Calvary. If the Swoon Theory were correct, then these women would certainly have seen at least a glimmer of life in the body of Jesus as he was removed from the cross. Mark tells us that when news of Jesus’ apparent death had reached Pilate, he “marveled” over this because he knew from experience that it took at least a couple of days to expire while crucified (Mark 15:44). Jesus had been on the cross for just a few hours. Interestingly, Mark further tells us that it was this same Joseph who “craved for the body of Jesus” and actually went to Pilate to ask him to turn it over to him. A Christian may point out the fact that Pilate confirmed Jesus’ death via a Roman centurion before he gave his body to Joseph. He will also inform l you that the Romans were extremely gifted in this practice of killing and soldiers knew that they would be killed themselves if they failed to completely carry out their duties. You can agree with him here but remind him that God does whatever He wills. Truly if God wanted to save His Messiah from death, making a Roman guard believe that Jesus was already dead would certainly be no problem. If fact, God in the Qur’an says this very thing: “But they (Jesus’ enemies) killed him not, nor crucified (caused him to die on a cross) him, but so it was made to appear to them” (Qur’an 4:157). Mark then tells us that it was exactly these three women (the two Marys and Salome) who came to the tomb on Sunday morning to “anoint” the body of Jesus (Mark 16:1). Why would these women want to anoint a dead rotting corpse after three days? Was this a common practice amongst the Jews? Isn’t it obvious that these women came to tend to the wounded, ailing, and weary Jesus who had survived his ordeal and thus fulfilled the sign of Jonah? John, recognizing the folly of the synoptic evangelists, tells us in Chapter 19 verse 39 that Nicodemus and Joseph anointed the body of Jesus the night of the crucifixion with myrrh and aloes, 100 pounds in all. The author of the Fourth Gospel wants to make it crystal clear, without a shadow of doubt that Jesus did in fact die on the cross. John further proves this point by concocting an incident in which Jesus is impaled with a spear to ensure non-survival, a touch that the synoptics are ignorant of. In all four Gospels we are told that at least one woman of those present at the crucifixion visited the tomb on Easter Sunday morning. Mark and Luke say that it was to “anoint” Jesus (Mark 16:1; Luke 24:1), which cannot be true since John says that this was already done, while Matthew and John provide no reasons for their unorthodox visits (Matthew 28:1; John 20:1). John also mentions the episode in which Mary weeps while facing the empty sepulcher only to hear Jesus’ voice behind her say, “Woman, why weepest thou? whom seekest thou?” Since Mary is not able to recognize the “gardening” Jesus, she comments, “Sir, if thou have borne him hence, tell me where thou hast laid him, and I will take him away.” Was this the intention of Mary, to “take away” Jesus? Where would she take him, to another tomb? If John is correct about the time of anointing, then Mary would have had to carry a corpse which would easily weigh in excess of 250 pounds (Jesus plus 100 pounds of myrrh and aloes), all by herself! Unlike the disciples who were terrified upon seeing Jesus in the Upper Room, Mary becomes filled with joy because she knows that this was no ghost or spirit, but only Jesus wounded but alive. Let’s pretend for arguments’ sake that Jesus was decapitated while he was on the cross, a fate that some of his disciples would later endure. Would you expect a resurrected Jesus to be walking around headless? Of course not, he would be “transformed” and healed, made spiritual, and raised incorruptible (to use Paul’s word). Yet Christians do not believe that Jesus’ resurrected body became spiritualized. Therefore, just as Jesus showed Thomas his various wounds to prove his physical “resurrection,” had his legs been broken, he would have also shown Thomas his bones protruding from his shins. If the Romans had amputated his legs, then Jesus would have required major assistance simply to meet with his disciples. The disciples of John the Baptist buried their teacher’s headless body yet Herod believed that Jesus was John resurrected and made spiritual. This provides further proof that resurrected bodies become spiritualized and immortal, and if Jesus was not spiritualized as Christians claim, then he was not resurrected either. The Christian wants the best of both worlds. He will say that Jesus was physically raised yet immortal, he was incorruptible yet not spiritual. You should not be surprised by these illogical beliefs. After all, according to Christianity, three equals one, man is God, bread is flesh, wine is blood, death is salvation, and begotten means unique! Christians believe that the most solid fact in human history was the death and resurrection of Jesus Christ. Apologists claim that no other ancient book surpasses the reliability of the Gospel accounts as recorded by the four evangelists in the Bible. You will hear them say, “The Bible is documented historical evidence that Jesus died on the cross and arose three days later and you (Muslims) reject this because some book revealed 600 years after the fact told you so!” Respond by agreeing that the Bible is exactly that, a history book. Point out to the Christian the following example: In 1990, we read in our American history textbooks that Thomas Jefferson died on July 4, 1826 leaving a wife and a few white children behind. In 2000, you might have read that Jefferson actually fathered five more children with one of his slaves Sally Hemings. Has history changed? History has not, only our perception of it has. In this case, science has proven that we can’t always rely on what’s written in the history books. As more and more evidence comes to light, we may be forced to rethink the validity of certain past events that we always thought were unshakably true. This is precisely what the Qur’an has done to the Bible. It confirmed some of it, corrected some of it, and rejected some of it. There never was a Trinity, a begotten Son of God, or a crucifixion of Jesus Christ. • “And as they came down from the mountain, he charged them that they should tell no man what things they had seen, till the Son of man were risen from the dead.” – Mark 9:9. • “And they shall scourge [him], and put him to death: and the third day he shall rise again.” – Luke 18:33. • “For he taught his disciples, and said unto them, The Son of man is delivered into the hands of men, and they shall kill him; and after that he is killed, he shall rise the third day.” – Mark 9:31. “Do these verses seem clear enough to you!” the Christian will ask. Ask him if we can, for just one second, take these sayings to be figurative and he will immediately roll his eyes and blurt, “No! Isn’t it obvious what he is saying!? How blind are you Muslims!” Surely the disciples should have had no problems understanding Jesus, after all, we are told that Jesus “spoke not to them (the general populace) without a parable; but he explained everything secretly to his own disciples” (Mark 4:34). Of course this contradicts John who quotes Jesus before the Sanhedrin: “I spake openly to the world; I ever taught in the synagogue, and in the temple, whither the Jews always resort; and in secret have I said nothing.” (John 118:20). • “And they kept that saying with themselves, questioning one with another what the rising from the dead should mean” (Mark 9:10, NKJV). “So they kept it to themselves, but they often asked each other what he meant by “rising from the dead” (Mark 9:10, NLT). • “And they understood none of these things: and this saying was hid from them, neither knew they the things which were spoken” (Luke 18:34, NKJV). “But they didn’t understand a thing he said. Its significance was hidden from them, and they failed to grasp what he was talking about” (Luke 18:34, NLT). • “But they understood not that saying, and were afraid to ask him” (Mark 9-32, NKJV). It appears as if the disciples had little idea as to what Jesus was talking about. But why? Perhaps they understood these statements to be totally literal and debated mutually about whether or not Pagans could even kill the Messiah. Unlike Paul, they conceived of the paradoxical implications of a dead Messiah. For the disciples, a dead Messiah was no Messiah at all. • Mark tells us that a certain scribe wanted to follow Jesus but asked the latter if he could go bury his father first. Jesus responded: “Follow me; and let the dead bury their dead” (Mark 8:22). The first occurrence of the word “dead” is used figuratively by Jesus to represent the spiritually dead, those who have rejected his message. Also see Luke 9:60. • Matthew tells us of a ruler to requested Jesus to raise his dead daughter. Jesus responded: “Give place: for the maid is not dead, but sleepeth. And they laughed him to scorn” (Matthew 9:24). Is it possible that the maid only appeared dead? Perhaps this is what Jesus intended when he said that he would be “dead.” Also see Mark 5:39 and Luke 8:52. • Jesus responds to a question put forth by a Sadducee: “But as touching the resurrection of the dead, have ye not read that which was spoken unto you by God, saying, I am the God of Abraham, and the God of Isaac, and the God of Jacob? God is not the God of the dead, but of the living” (Matthew 22:31-32). Obviously, Abraham, Isaac, and Jacob were all physically dead yet still alive in their spirit of teaching. Also see Mark 12:27 and Luke 20:38. • When the guards posted at the tomb saw an angel roll back the stone, they were filled with fear and “became as dead men” (Matthew 28:4). • After Jesus exorcises a demon from a man, Mark comments: “and he was as one dead; insomuch that many said, He is dead” (Mark 9:26). Yet he was not dead because the next verse states: “But Jesus took him by the hand, and lifted him up; and he arose” (Mark 9:27). • In his parable of the Prodigal Son, Jesus says: “For this my son was dead, and is alive again; he was lost, and is found. And they began to be merry” (Luke 15:24). The words “dead” and “lost” are used synonymously. • Paul says, “I protest by your rejoicing which I have in Christ Jesus our Lord, I die daily” ( I Corinthians 15:31). He means that he suffers daily. Christians believe that before the creation of the earth, the Father and Son made a contract together stipulating that the latter would enter into flesh and redeem mankind in the year 4000 (after Adam). They believe that the death and resurrection of Jesus was something ordained since time immemorial. Using this logic, the greatest Christian saint of all time should have been Judas Iscariot! Was he not the one who made it all possible? It seems extremely unjust to hold him in contempt for doing something that 1) was already preordained 4000 years prior by God and 2) necessary for the redemption of mankind. Yet after all of this, Jesus calls poor Judas “a traitor.” Maybe Jesus didn’t want to die after all? In fact, the synoptics actually record Jesus asking for his life. It appears as if Jesus knows nothing about the contract he supposedly made in heaven with his Father. Why is he so reluctant to die? Even an average zealot will go to his death readily if it meant martyrdom. As is his style, John omits Jesus’ prayer to provide his readers with a sense of security that Jesus did in fact go willingly. • “And he went a little further, and fell on his face, and prayed, saying, O my Father, if it be possible, let this cup pass from me: nevertheless not as I l will, but as thou [wilt].” -Matthew 26:39. • “And he said, Abba, Father, all things [are] possible unto thee; take away this cup from me: nevertheless not what I will, but what thou wilt.” – Mark 14:36. • “Saying, Father, if thou be willing, remove this cup from me: nevertheless not my will, but thine, be done.” – Luke 22:42. According to Jesus’ own teaching, God must answer his request and deliver him. He said: “If a son shall ask bread of any of you that is a father, will he give him a stone? or if [he ask] a fish, will he for a fish give him a serpent?” (Luke 11:11; Also see Mark 7:10). “And I say unto you, ask, and it shall be given you; seek, and ye shall find; knock, and it shall be opened unto you” (Luke 11:98; Also see Matthew 7:7). “But I know, that even now, whatsoever thou wilt ask of God, God will give [it] thee” (John 11:22). Instead of throwing him a fish, God decides to have His Son spat upon, stripped, scourged, nailed to a cross, and finally sent to Hell for three days and Christians call this love? Even up until the very end Jesus is defiant. He wails on the cross: “Eli, Eli, lama sabachthani? That is to say, My God, my God, why hast thou forsaken me” (Matthew 27:46)? Are these the words of a willing sacrifice? Shouldn’t he be happy about completing his mission and saving the world? Instead he tells his disciples just before his arrest: “My soul is exceeding sorrowful unto death” (Mark 14:34). Crying, complaining, sweating, and bargaining? Consider McDowell’s words: “When he went to the cross almost 2000 years ago, a holy, just, righteous God poured out his wrath upon his Son.” God kills an innocent man and Christians call it “holy, just, and righteous”! After the apparent death of Jesus on the cross, the witnessing of Paul and the Hellenizers found staunch opposition from most Jews over one issue: How can the Romans kill the Messiah? Paul professes: “But we preach Christ crucified, unto the Jews a stumblingblock, and unto the Greeks foolishness” (I Corinthians 1:23). Therefore, the heavily Paulized New Testament authors took it upon themselves to search long and hard for passages in the Hebrew Bible that they could incorporate into their evangelical accounts. Isaiah 53 and Psalm 22 tickled them the most, and these along with other socalled prophecies of the death of Christ are examined below. Christians say that Zechariah 11:12-13 is fulfilled by Matthew 27:9. Here are the verses respectively: “And I said unto them, If ye think good, give [me] my price; and if not, forbear. So they weighed for my price thirty [pieces] of silver” (Zechariah 11:12); “Then was fulfilled that which was spoken by Jeremy the prophet, saying, And they took the thirty pieces of silver, the price of him that was valued, whom they of the children of Israel did value” (Matthew 27:9). Did you notice it? Matthew erroneously cites the book of Jeremiah instead of Zechariah! Jeremiah only mentions “seventeen shekels of silver” (Jeremiah 32:9). Yet Christians believe this is God talking. Isaiah tells us: “He is despised and rejected of men; a man of sorrows, and acquainted with grief: and we hid as it were [our] faces from him; he was despised, and we esteemed him not…But he [was] wounded for our transgressions, [he was] bruised for our iniquities: the chastisement of our peace [was] upon him; and with his stripes we are healed…He was oppressed, and he was afflicted, yet he opened not his mouth: he is brought as a lamb to the slaughter, and as a sheep before her shearers is dumb, so he openeth not his mouth. He was taken from prison and from judgment: and who shall declare his generation? For he was cut off out of the land of the living: for the transgression of my people was he stricken” (Isaiah 53:3, 5, 7-8). To defend Jesus against charges that he “failed” to re-establish David’ kingdom, early Christians point to certain passages in the Hebrew Bible that seemed to them to illustrate the nature of Jesus’ unexpected messiahship. In Christian interpretations of the Messiah, he became the “prophet like Moses” described ) in Deuteronomy (18:15-20) and the mysterious “suffering servant” in Isaiah (52:13-53:12). In the original texts, neither the Mosaic prophet nor the anonymous servant is associated with the Messiah, and we do not know whether these two unidentified figures were given messianic emphasis before the Christian period (pages 75-76). McDowell admits: “The suffering Messiah was completely foreign to the Jewish conception of messiahship” (page 73). Also, when Pilate asks Jesus flatly, “what hast thou done?” (John 18:35), Jesus becomes his own lawyer again and says: “My kingdom is not of this world: if my kingdom were of this world, then would my servants fight, that I should not be delivered to the Jews: but now is my kingdom not from hence” (John 18:36). Basically saying: “You don’t have to worry about me. I will not try to overthrow Rome with zealotry. My teaching is only spiritual in nature.” After these words, Pilate goes to the angry mob outside and declares, “I find in him no fault at all” (John 18:38). Consider the phrases, “he is brought as a lamb led to the slaughter” and “he was cut off out of the land of the living.” These words were fulfilled in the person of the Hebrew Prophet Jeremiah, not Jesus. In Jeremiah 11:19 we are told: “But I was like a gentle lamb led to the slaughter. I did not know it was against me they devised schemes, saying, ‘Let us destroy the tree with its fruit, let us cut him off from the land of the living, that his name be remembered no more’” (RSV). Jeremiah was rejected and afflicted by his people after warning them of the terrible Babylonian punishment on the horizon. He was mocked, ridiculed, spat on, flogged, imprisoned, and eventually killed for his trouble. It was not for his people’s sins that Jeremiah was made to suffer, but rather because of their sins – they simply would not believe in him. Many scholars believe that either chapter 53 was written by the prophet Isaiah himself or by some other contemporary who prophesized the ministry of Jeremiah, or that it was actually written in retrospect after Jeremiah’s death by a Jewish scribe living in Babylon. Either way, it is definitely not a reference to Jesus Christ. Zechariah 13:7 reads: “Awake, O sword, against my shepherd, and against the man [that is] my fellow, saith the Lord of hosts: smite the shepherd, and the sheep shall be scattered: and I will turn mine hand upon the little ones.” Both Mark and Matthew tell us that at the most critical juncture in the life of Jesus, “all of his disciples forsook him and fled” (Mark 14:50; Matthew 26:56). When Muslims try to point out that all of Jesus’ disciples deserted him and did not witness what had happened at Calvary, Christians retort that “the disciple whom Jesus loved” was there and even stood at the foot of the cross (John 19:26). Just as John invented the impaling incident to prove Jesus’ death, he also places a disciple at the crucifixion thus contradicting the synoptics which mention that all of his disciples left him in the lurch. John also mentions that two “secret disciples,” Joseph of Arimathaea and Nicodemus removed Jesus’ body from the cross. It’s unfortunate that we don’t have first hand accounts from either of these two men as to what they noticed about Jesus’ “dead” body. Peter did “follow at a distance,” but before Jesus’ trial even began, “he went out, and wept bitterly,” and is not mentioned again until Easter Sunday. Therefore, he was not present at the cross. Ask your Christian friend why the synoptics maintain that all of Jesus disciples forsook him and fled when “the disciple whom Jesus loved” and two secret disciples stayed put? Either the synoptics are wrong or John is mistaken. David says: “My God, my God, why hast thou forsaken me? [why art thou so] far from helping me, [and from] the words of my roaring?… For dogs have compassed me: the assembly of the wicked have inclosed me: they pierced my hands and my feet…They part my garments among them, and cast lots upon my vesture” (Psalm 22:1,16,18). This is obviously nothing more than the evangelists’ attempts to legitimize the death of the Messiah, but yet again, there is no mention whatsoever that this is referring to God’s Anointed. The evangelists have borrowed freely from the Old Testament in order to get their theological doctrine across, but when the Qur’an confirms a story or an event found within l the Hebrew Bible, the Christians call Muhammad a forger! Christians believe that John 19:33-36 fulfills Psalms 34:20 where it states: “He keepeth all his bones: not one of them is broken.” This is taken viciously out of context. Let’s look at the three preceding verses: “The righteous cry, and the Lord heareth, and delivereth them out of all their troubles. The Lord [is] nigh unto them that are of a broken heart; and saveth such as be of a contrite spirit. Many [are] the afflictions of the righteous: but the Lord delivereth him out of them all” (Psalms 34:17-19). Notice the word “all” mentioned twice in this passage. God will deliver those who call upon Him from all of their troubles and afflictions. Does this verse really find its fulfillment in the Christian Jesus who was apparently beaten beyond recognition, pricked by thorns, scourged mercilessly, and had stakes driven through his hands and feet? But God “delivered” him by not braking any of his bones? Ridiculous! “He that dwelleth in the secret place of the most High shall abide under the shadow of the Almighty. I will say of the Lord, [He is] my refuge and my fortress: my God; in him will I trust. Surely he shall deliver thee from the snare of the fowler, [and] from the noisome pestilence. He shall cover thee with his feathers, and under his wings shalt thou trust: his truth [shall be thy] shield and buckler. Thou shalt not be afraid for the terror by night; [nor] for the arrow [that] flieth by day; [Nor] for the pestilence [that] walketh in darkness; [nor] for the destruction [that] wasteth at noonday. A thousand shall fall at thy side, and ten thousand at thy right hand; [but] it shall not come nigh thee. Only with thine eyes shalt thou behold and see the reward of the wicked. Because thou hast made the Lord, [which is] my refuge, [even] the most High, thy habitation; There shall no evil befall thee, neither shall any plague come nigh thy dwelling. For he shall give his angels charge over thee, to keep thee in all thy ways. They shall bear thee up in [their] hands, lest thou dash thy foot against a stone. Thou shalt tread upon the lion and adder: the young lion and the dragon shalt thou trample under feet. Because he hath set his love upon me, therefore will I deliver him: I will set him on high, because he hath known my name. He shall call upon me, and I will answer him: I [will be] with him in trouble; I will deliver him, and honour him. With long life will I satisfy him, and shew him my salvation.” Psalm 91. Compare “they shall bear thee up in their hands” to “God raised him up unto Himself” (Qur’an 4:158). King David writes: “We will rejoice in thy salvation, and in the name of our God we will set up [our] banners: the Lord fulfil all thy petitions. Now know I that the Lord saveth his Anointed; he will hear him from his holy heaven with the saving strength of his right hand. Some [trust] in chariots, and some in horses: but we will remember the name of the Lord our God” (Psalm 20:5-7). Verse 6 transliterated reads: At-tah yadha-tiki hoshiya adonai meshicho, anehu mishemey qodsho bighb-huroth yesha yemeeno. There is no ambiguity here whatsoever. The words for “saveth,” and “anointed” are hoshiya and Meshicho respectively. The Meshicho, or rather Messiah, is the Christ. Can it be any more clear: God saves His Messiah! The majority of Christians believe Jesus’ true name to be Yeshua, a name that has exactly the same etymological root meaning and significance as the word hoshiya in verse 6. The root word being yasha, “to save.” According to the Strongs’ Concordance, Yeshua means “he is saved,” not Savior. Hoshiya: 1) to save, be saved, be delivered. Christians are quick to quote Psalm 22 or 34 and claim that they are foretelling the death of the Messiah when there is no specific reference to him at all. Yet when he is mentioned specifically in Psalm 20 and other passages presented below as being saved by God, Christians suddenly become ignorant! Replace the word “Anointed” with Messiah or Christ: “He delivereth me from mine enemies: yea, thou liftest me up above those that rise up against me: thou hast delivered me from the violent man. Therefore will I give thanks unto thee, O Lord, among the heathen, and sing praises unto thy name. Great deliverance giveth he to his king; and showeth mercy to his Anointed, to David, and to his seed for evermore” (Psalm 18:48-50). Again we have a very specific messianic prophecy of the saving of God’s Anointed which matches exactly with what the Qur’an says happened to Jesus yet Christians remain deluded! “Blessed [be] the Lord, because he hath heard the voice of my supplications. The Lord [is] my strength and my shield; my heart trusted in him, and I am helped: therefore my heart greatly rejoiceth; and with my song will I praise him. The Lord [is] their strength, and he [is] the saving strength of his Anointed (Messiah)” (Psalms 28:6-8). “When they went from one nation to another, from [one] kingdom to another people; He suffered no man to do them wrong: yea, he reproved kings for their sakes; [Saying], Touch not mine Anointed (Christ), and do my prophets no harm” (Psalm 105:13-15). According to the Old Testament, priests would consecrate as king a prophet or prince by anointing the latter’s head with oil from the sacred tabernacle. The people who witnessed this event would then shout, “God save the king (messiah)!” Certainly Solomon was a king, a great and wise king, but he was not the King. That office belonged to only one person, the Christ of God who is Jesus (upon whom be peace). If God saved his lesser messiahs from harm, then how much more would He protect His true Messiah? • “And Zadok the priest took a horn of oil out of the tabernacle, and anointed (mashach) Solomon. And they blew the trumpet; and all the people said, God save king Solomon.” – I Kings 1:39. • “And he brought forth the king’s son, and put the crown upon him, and [gave him] the testimony; and they made him king, and anointed (mashach) him; and they clapped their hands, and said, God save the king.” – II Kings 11:12. • “Then they brought out the king’s son, and put upon him the crown, and [gave him] the testimony, and made him king. And Jehoiada and his sons anointed (mashach) him, and said, God save the king.” – II Chronicles 23:11. The Substitution Theory states that someone else who resembled or was made to resemble Jesus was nailed to the cross and crucified while Jesus himself remained totally unharmed. This is the more widely accepted theory among Muslim scholars and as already noted, confirms Jewish expectations of the Messiah. Stress again to your Christian friend that this is only a possibility and that God alone knows how this was actually accomplished. Who is this man Simon of Cyrene? The Gospels do not mention him prior to or after the crucifixion. Could it be that Simon was seized by the Romans during the riotous atmosphere and crucified instead of Jesus? His son, Alexander, is mentioned twice by Paul using extremely harsh language: “Alexander the coppersmith did me much evil: the Lord reward him according to his works” (II Timothy 4:14); “Of whom is Hymenaeus and Alexander; whom I have delivered unto Satan, that they may learn not to blaspheme” (I Timothy 1:20). If this is the same Alexander bar Shimon, then why does Paul despise him so much? Perhaps Alexander opposed Paul’s paradoxical doctrine of the murdered Messiah by claiming that his father was killed in Jesus’ place. 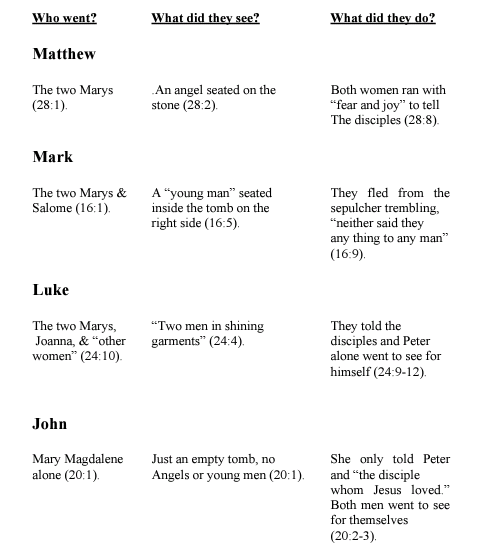 Using Mark as their primary source, both Matthew and Luke prefer not to mention the sons of Simon for reasons that remain unknown. Amazingly, John makes absolutely no mention of Simon at all! He tells us: “And he (Jesus) bearing his own cross went forth into a place called [the place] of a skull, which is called in the Hebrew Golgotha” (John 19:17). Who is lying, John or the synoptic evangelists? Stress again to your Christian friend that the intention behind the writing of John’s Gospel by the Johannine community was to tie up the many loose ends of the Jesus event. The ambiguous divinity of Christ, his mysterious death on the cross, and his unsettling “no show” second coming are problem areas that John attempts to address and resolve. As already stated, John invents an impaling of Jesus on the cross as well as contradicts the synoptics by claiming that Jesus was anointed by his secret disciples the very night of his “death” and that a disciple was present at the crucifixion. Now he goes a step further and says that Jesus bore his own cross to Golgotha to give us the assurance that he, and not Simon, was the one actually killed. John’s highly mystical Christology seems to be in response to some of the Gnostic elements found amongst the Christian communities of the first century. Harris says (emphasis Harris’): “One branch of Gnosticism, called Docetism (a name taken from the Greek verb ‘to seem’) argued that Christ, being good, could not also be human; he only seemed to have a physical body. The Docetists contended that as God’s true son, Christ was wholly spiritual, ascending to heaven while leaving another’s body on the cross” (page 194). Although we as Muslims cannot totally agree with this statement, we can certainly appreciate its testimony that there were in fact many divergent early Christian opinions with regards to the so-called crucifixion. The Johannine community declares: “Every spirit that confesseth that Jesus Christ is come in the flesh is of God. And every spirit that confesseth not that Jesus Christ is come in the flesh is not of God: and this is that [spirit] of antichrist, whereof ye have heard that it should come; and even now already is it in the world” (I John 4:2-3). The Fourth Gospel and three epistles of John eventually defined what became the official church view of Jesus’ dual nature. But is it this simple? If a spirit confesses that Jesus Christ is come in the flesh he is of God? Mark tells us that unclean demonic spirits declared to Jesus: “I know thee who thou art, the Holy One of God” (Mark 1:24); “Thou art the Son of God” (Mark 3:11); “What have I to do with thee, Jesus, [thou] Son of the most high God? I adjure thee by God, that thou torment me not” (Mark 5:7). Are these spirits of God? The end of the life of Jesus on earth is as much involved in mystery as his birth, and indeed the greater part of his private life, except the three main years of his ministry. It is not profitable to discuss the many doubts and conjectures among the early Christian sects and among Muslim theologians. The Orthodox Christian Churches make it a cardinal point in their doctrine that his life was taken on the Cross, that he died and was buried, that on the third day he rose in the body with his wounds intact, and walked about and conversed, and ate with his disciples, and was afterward taken up bodily to heaven. This is necessary for the theological doctrine of blood sacrifice and vicarious atonement for sins, which is rejected by Islam. But some of the early Christian sects did not believe that Christ was killed on the Cross. The Basilidans believed that someone else was substituted for him. The Docetae held that Christ never had a real physical or natural body, but only an apparent or phantom body, and that his Crucifixion was merely apparent, not real. The Marcionite Gospel (about A.C. 138) denied that Jesus was born, and merely said that he appeared in human form. The Gospel of St. Barnabas supported the theory of substitution on the Cross. The Qur’anic teaching is that Christ was not crucified nor killed by the Jews, notwithstanding certain apparent circumstances which produced that illusion in the minds of some of his enemies; that disputations, doubts, and conjectures on such matters are vain; and that he was taken up to Allah.